“He is a racist. He is a con man. And he is a cheat,” President Trump's former lawyer, Michael Cohen said of the president. “I am not protecting Mr. Trump anymore,” Cohen said, stating the obvious, so to speak. Obvious, indeed! Other than the inherently up-close and personal dimension that comes with the territory when someone has been for years a close associate of the person he is denouncing, what substantively new revelations have we learned that we did not know already? If, as Cohen claims, "racist ... con man ... cheat" is a reasonable assessment of the president's character, who did not know that already before the last election? More to the point, how many Trump voters would have been surprised by what Cohen had to say? In our politically polarized society, politics had become simply another expression of our increasingly unbridgeable cultural divide(s). Politics has increasingly become more and more about hating the other than about anything else. The point is not how many Trump voters may have voted for him because of his admirable moral character and now are suddenly going to reconsider their allegiance because of new revelations (which largely conform what was always already known anyway). The point is rather how many voted for Trump primarily out of hatred for the other side, whether that other side is understood by them primarily as privileged uncaring elites or as immigrants or other historically marginalized groups, or de facto an alliance of privileged uncaring elites with those other historically marginalized groups. It may be politically possible for a certain sort of economic populism to bridge that ever growing divide that has been created by the malevolent miasma of cultural populism. Whether that will in fact happen very much remains to be seen. The NY Times Editorial Board cutely commented on the President's supposed "emergency," calling it "the presidential equivalent of phoning 911 because your pizza delivery is taking too long." But, of course, it is much more serious than that. Not only is it a dishonest fabrication of a non-existent "emergency," but it is also and more importantly a direct challenge to our constitutional system. As in ancient Rome, the transition from republic to empire has (perhaps inevitably) involved a transition from legislative to executive dominance, from constitutional norms to Caesar's norms - most notably in the area of executive (as opposed to congressional) war making, but also in so many other areas as congress has consistently abdicated its assigned responsibilities. 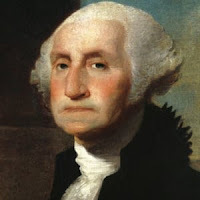 Over the years, we have become increasingly accustomed to presidents acting on their own and have even often applauded it when we preferred the particular policy and despaired of Congress ever actually acting as it was meant to act by Article I of the Constitution. That said, this president seems here to have crossed that proverbial "red line," brazenly acting on his own to spend money on a project which congress has already debated and decided otherwise. The challenge to any residual notion of constitutional and congressional respectability is evident in the extreme. Fortunately for Congress (or, perhaps, unfortunately for those members who consistently prefer not exercise the responsibilities they were elected to exercise), The National Emergencies Act of 1976 specifies a procedure for Congress to follow in just this kind of case. And on Tuesday the House of Representatives will take the first step in that process, voting on a Joint Resolution of Disapproval. 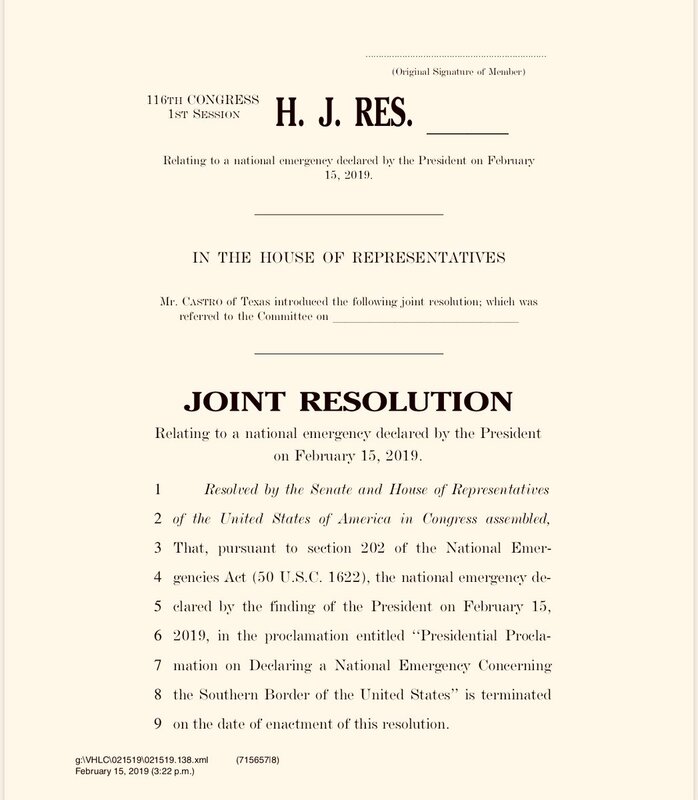 That Resolution (introduced by Democratic Congressman Joaquin Castro of Texas) says simply: Resolved by the Senate and House of Representatives of the United States of America in Congress assembled, That, pursuant to section 2020 of the National Emergencies Act (50 U.S.C. 1622), the national emergency declared by the finding of the President on February 15, 2019, in Proclamation 9844 (84 Fed. Reg. 4949) is here-by terminated. 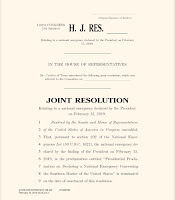 The nice thing about this is that, according to The National Emergencies Act of 1976 this Resolution is privileged and so, assuming it passes the House, it must be voted on by the Senate (within 18 days). So the Senate Majority Leader cannot play his usual role as obstacle to democratic decision-making. The Senate will serve as the real test of whether Congress can still function as it was intended to function. Will enough Republican Senators break with their party and vote for constitutional government? We will see. If they do so and the resolution passes, presumably the President will veto it. So Congress clearly cannot in that case on its own terminate this "emergency." Even so, Congress will have spoken clearly and made a major move in rediscovering its role in our constitutional system. Of course, in keeping with the way our system has evolved, the ultimate adjudication of this issue will almost certainly be by the judiciary - in this case, again almost certainly, the Supreme Court. How that body (newly populated with at least two presidential acolytes) will decide the case that comes before it is at present anybody's guess. A former pastor of mine used to like to say about preaching or teaching, un texto sin contexto es un pretexto, which translates into English pretty much the way it sounds, a text without context is a pretext. So what was the context for Jesus’ Blessings and Woes in today’s Gospel – and, much more to the point, what is our context within which we hear Jesus’ message today? Just before this, Jesus had been busy organizing his new community. After a night spent in prayer, he named 12 men to be his apostles, an obvious echo back to the 12 tribes of Israel, and the blessing originally promised the world through Abraham now being fulfilled in Jesus through his chosen Church. The kingdom of God, however, comes in the context of a world in which it is opposed. The poor, the hungry, the weeping, the hated, the excluded, and the insulted, whom Jesus was addressing, well understood the opposition to the kingdom of God on the part of the rich, the well off, the powerful, and the popular. Notice, however, that throughout his sermon Jesus spoke in the second person. He was not talking abstractly about economic, social, political, and cultural inequality the way a secular social scientist might. In a world in which the top 1% percent now owns some 50% of the world's wealth, a disparity which has been growing not shrinking for decades now, such analysis is important. But Jesus in today’s Gospel was taking that analysis way farther – farther and deeper into the hearts of his hearers. For he was talking directly to his disciples, which is to say, to us. Blessed are you, blessed are we, who are poor. Woe to you, woe to us, who are rich. He wasn’t praising his disciples and denouncing the pagans, comparing and contrasting them as if they were two opposing political parties. He was challenging his disciples, us, to examine our own consciences about what wealth and power and popularity mean to us, what role they play in our lives, their corrupting effect upon our relationships with the rest of the world, with the rest of God’s people, and the obstacles they build between us and the kingdom of God. Homily for the 6th Sunday in Ordinary Time, Immaculate Conception Church, Knoxville, TN, February 17, 2019. Pete Buttigieg, the charismatic young Mayor of South Bend, who is sounding more and more serious as a presidential candidate, recently said in an interview for The New Yorker, "It is very pragmatic to look around and say, well, the countries that do this [universal health care] tend to be better than the countries that don't. the system we have isn't working very well, we ought to try this other system. Politically, it's never been possible, because it's been considered socialism, and socialism was a kill switch. Our generation did not live through the Cold War in the same way" (Benjamin Wallace-Wells, "Pete Buttigieg's Quiet Rebellion"). Well, I did live through the Cold War, and the targeting of one's opponents ideas as "socialism" long ago ceased to be "a kill switch" for me, if ever it was. The unhinged antipathy to "socialism" presently permeating right wing media may perhaps represent an honest historical ignorance of the multitude of differences between European social democracies and the Soviet Union under Stalin, or it may more likely merely reflect an incurable ideological obsession. Either way, there is no reason in 2019 for the rest of society to be cowed by it. 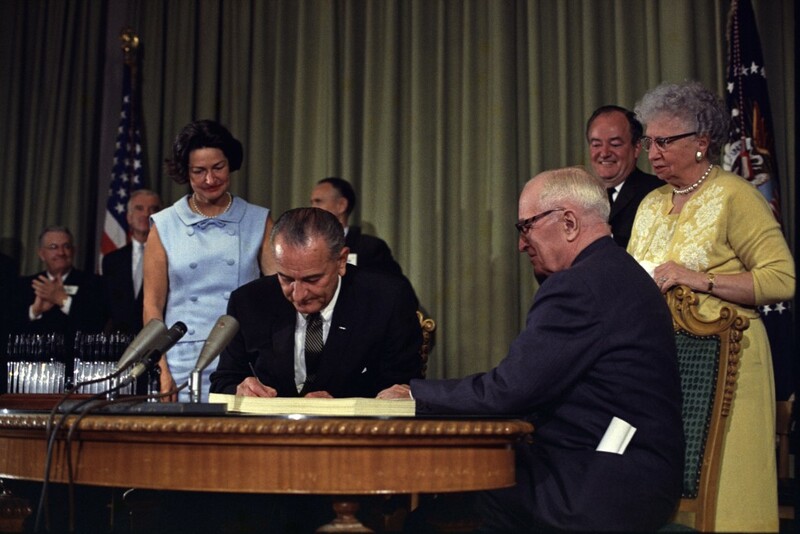 First proposed by President Harry Truman, then again by President Kennedy, Medicare was finally signed into law by President Lyndon Johnson in 1965 (photo). Its passage was possible thanks to the great 1964 Democratic landslide, which provided enough support in Congress to override the "kill switch" in the form of the nonsense then being peddled by the likes of Ronald Reagan (soon to run for governor of California), who said it would "invade every area of freedom in this country until one day ... we will awake to find that we have socialism." How strange this pervasive (and persistent) animus against providing people with adequate health care, even after any practical arguments had been refuted by the nearly universal experience of other advanced economies! LBJ couldn't get universal health care, but at least he got something for seniors (Medicare) and for the poor (Medicaid). It has been suggested that he had hoped gradually to lower the age for Medicare and might have gone in that direction had it not been for Vietnam. We know that President Nixon also contemplated lowering the age and universalizing medicare in 1973, but that that too got derailed. So "Medicare for All" is not a novel notion at all. But "Medicare for All" is just the method, just a way to get to universal health care. The latter is the goal, the end. The former is merely the means - albeit the most obvious means given our history and present circumstances. Given that history and our present circumstances, President Obama accomplished a great deal with the Affordable Care Act, and our country is a better place as a result. Even so, the goal of universal care still eludes us, even as the cost of health care continues to rise, and private insurers still continue to profit, all of which could be fixed by something like Medicare for All, which would cover everyone, for less than we are all paying now, and without enriching private insurers, What's not to like? The inevitable red herring in any debate about universal health care is, of course, taxes, a perennial problem in a society which is chronically resistant to the concept of community and the shared burdens community calls for. Even so, what needs to be stressed in any serious political advocacy is that the increased taxes which would be necessary to pay for universal health care would replace the more expensive present system of insurance premiums, deductibles, and co-pays.